Description: Limited edition Toot Toot Engine that was made for the annual Fisher-Price convention in East Aurora, NY called "Toyfest". This Toyfest collectible was made in limited quantities of 4,800. FPT8599 - Small train engine with a black litho "boilder" body, black smoke stack on top of the boiler, YELLOW cowcatcher and headlight on the front, and a RED covered cab in the back. Bottom of base is marked with a serial number 1 to 4800 in hand-stamped black ink. FPT3865 - Small train engine with a black litho "boilder" body, black smoke stack on top of the boiler, RED cowcatcher and headlight on the front, and a YELLOW covered cab in the back. Bottom of base is marked with a serial number 1 to 4800 in hand-stamped black ink. FPT8606 - Small train engine with a black litho "boilder" body, black smoke stack on top of the boiler, YELLOW cowcatcher and headlight on the front, and a RED covered cab in the back. Bottom of base is NOT marked. FPT3914 - Small train engine with a black litho "boilder" body, black smoke stack on top of the boiler, RED cowcatcher and headlight on the front, and a YELLOW covered cab in the back. Bottom of base is NOT marked. Also see 1959's #642 Dinkey Engine. Also see 1960-1962's #642 Smokie Engine. Also see 1962-1964's #641 Toot-Toot Engine. 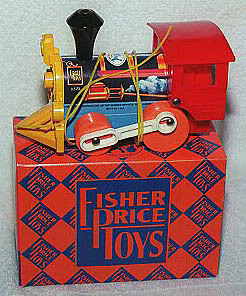 FP6575SET1989 - Complete set in original box. WFL: 07-AD-01-B-F.